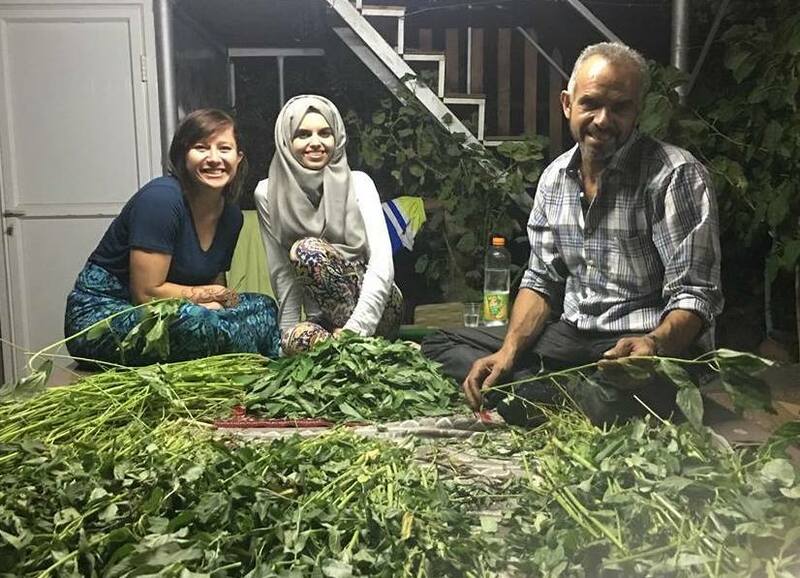 Hershey (left) with her host family in Hebron, Palestine. We are all on different missions, sent here to help people in a way that only we know how. My answer to the infamous question, “What do you want to do when you grow up?” was always, “I want to help people.” Cue the eye roll! What. A. Millennial. However, I stood by my answer and still do, but I didn’t know how I was going to help. Since then, I’ve realized that maybe we’re not necessarily supposed to know. This is a window into my journey that’s led to my enrollment in Roosevelt’s Community Development & Action graduate program. It’s been nearly four years since I graduated from Wright State University in Dayton, Ohio with a BA in International Studies. Contrary to what seemed a more traditional route, I chose to study the Middle East, peace and diplomacy, and Arabic. The more I studied, the more I realized how little I knew about the world we live in and our global co-inhabitants. Soon after graduation, I packed my car and moved to Chicago in search of some professional development and a better understanding of myself. Over the last few years, I’ve gained invaluable experience working full-time in an executive assistant role; however, I still didn’t feel passionate about my pursuit and overall contribution to society. Hershey volunteering in Chicago’s Buena Park neighborhood. 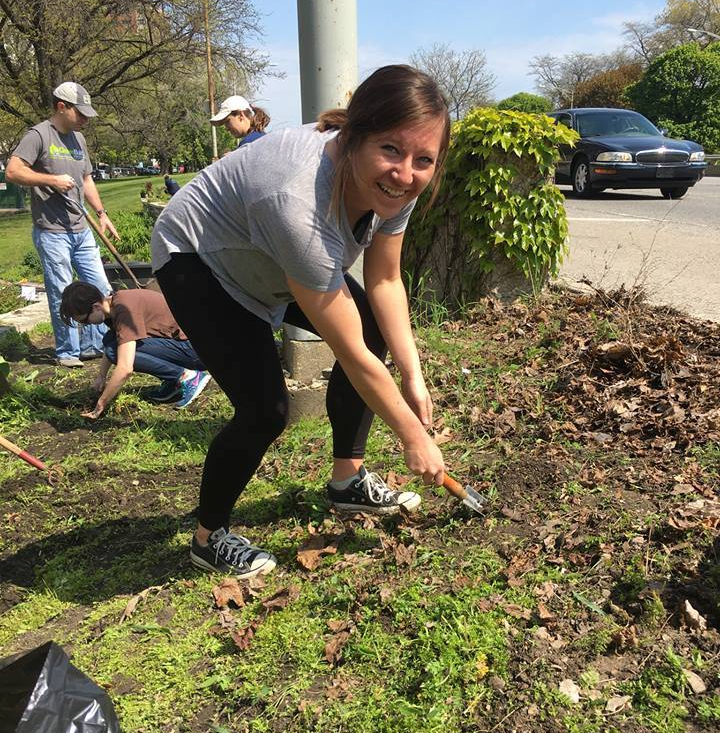 I began volunteering with my local neighborhood association in Buena Park, and soon discovered my passion for community development and organization. I was able to assimilate from my small-town Ohio upbringing to my new urban environment by becoming a regular volunteer and serving on several committees in my neighborhood association. It was here that I witnessed individual voices come together to make actual change happen and where I began to feel like I was a part of something bigger — something that mattered. With an intermediate level of Arabic, I decided to start volunteering with Arabic-speaking refugees. I wanted to work with those less fortunate and mentoring Syrian refugee families in Chicago enhanced my vision. Few things have felt as rewarding in my lifetime as spending time with and forging bonds with these families, as well as with the Syrian refugee teenage girl I mentor to this day. About a year ago, I was blessed with the opportunity to join the USA-Cuba Goodwill Tour as baseball teams from the respective countries travelled to Cuba to donate school and sporting equipment and interact with the local community through a common language: baseball. It was here that I saw a different level of poverty and it deeply moved me. It was also here that I first experienced a different level of generosity, a generosity so incredible it still gives me goosebumps. How could these two things — poverty and gratitude — coexist as strongly as they do? The answer to this question turned out to be central to the vision I had of life and my place in it. With this newfound inspiration, I was determined to see more of the world. Because of my experience in college as a delegate on the Council of Palestinian Affairs in the Model Arab League, I knew giving a voice to the voiceless was something I could tie into this budding vision. After some research and a lot of thought, I made a determination: My second international trip would be to the West Bank in Palestine. Bold move, sure. Many friends and family members warned me with horror stories they’d heard and tried to persuade me otherwise, and while I appreciated that they cared for my well-being, I felt very good about my decision. In August 2017, I traveled to the Middle East. I studied Arabic at an education and culture center in the city of Hebron and lived with an incredible host family. Palestine presented me with experiences I couldn’t have anticipated and a million opportunities to grow. Akin to my experience in Cuba, thinking about the level of poverty and yet the depths of generosity I encountered on a daily basis brought tears to my eyes. Throughout the trip, I witnessed several encounters of verbal and physical harassment against my Palestinian brothers and sisters. 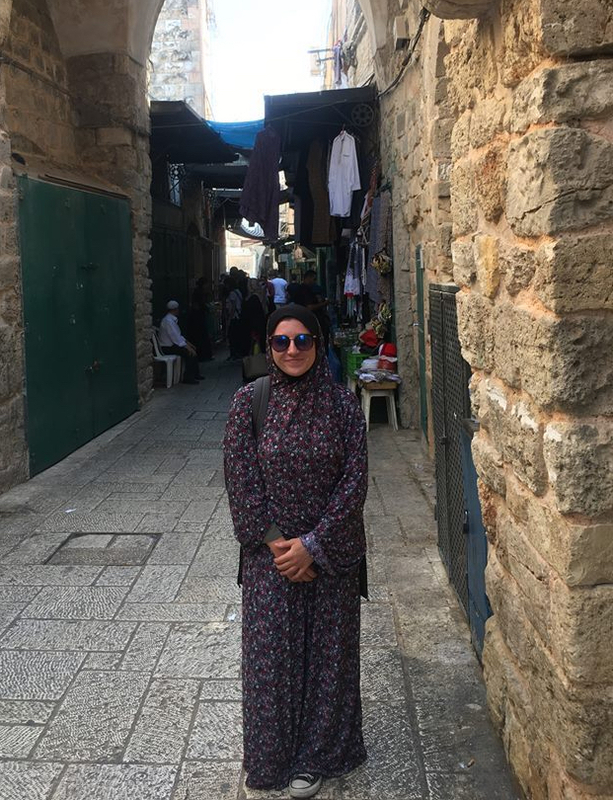 In Jerusalem, I bought and wore a full length Muslim gown and was verbally harassed by soldiers. However, my most profound experience was in Tel Aviv, when I was verbally harassed for about four hours by security guards at the airport. 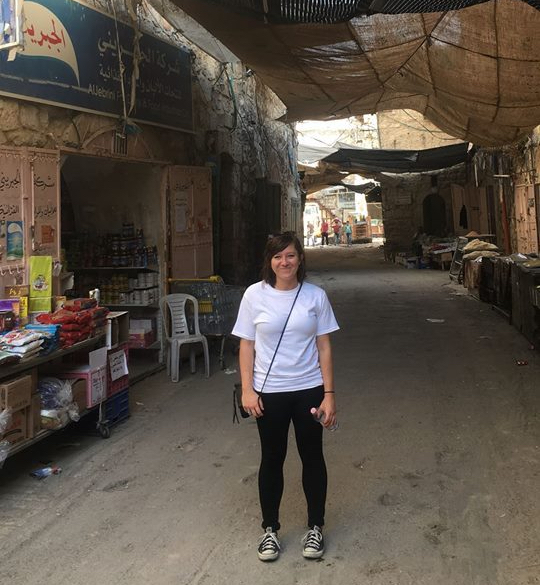 It was there that I not only witnessed, but truly felt what it was like to be attacked in this way … something I’d seen Palestinians go through on a daily basis but didn’t quite understand myself. Hershey in Jerusalem wearing traditional Muslim dress. After my trip to Palestine, I knew that my time in the classroom was far from over. I saw human rights violations in a way I couldn’t have imagined and had some of my own rights violated. I understood that my mission involved being true to myself no matter what and standing with those who were oppressed and silenced. I made a determination to one day work with refugees abroad promoting self-sufficiency programs and community development. Upon my return, however, I was still working at my full-time office job and felt deeply compelled to transition into something that would move me closer to my ultimate career goals. What was that next step? I had no idea. What I needed were the tools to help equip me in realizing my vision that had been shaped up until this point with my experiences at home and abroad. With this in mind, I came across Roosevelt’s Community Development & Action master’s program. The program resonated with me immediately and now, nearing the end of my first semester, I cannot imagine anything better suited for me. Looking back on my transition from working full-time to being a full-time graduate student, I truly feel like this program chose me. With classes where I choose projects that cater to my specific interests and gaining knowledge and developing skills directly applicable to the nature of my future work, I don’t think I could’ve found a better program to prepare me for whatever the universe throws at me next. My mission: To make an effort to shine no matter what, to love unconditionally, and to be a kind and gentle soul (even when nobody’s watching). Your love and compassion to serve others is Beautiful! He has BIG plans for you sweetie! !